I'm taking one more break before finishing the small venues series and publishing a post I wrote back in 2016. The current version of this post has been fleshed out and re-done. You might also note it was published in a Russian mining engineering magazine and will appear in May's edition of the Western Mining Alliance's bulletin. 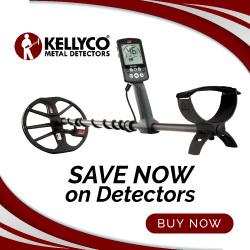 Whether you find your first gold nugget with a gold pan or a metal detector, it’s an event that will always remain a fond memory for any small-scale gold miner. I still remember my first nugget and just how excited I was by its discovery on my aunt's property just outside Nevada City, California nearly 40 years ago. I have to admit that as far as nuggets go it wasn’t much…slightly bigger than the head of a wooden kitchen match and tear-drop shaped. Since that happy day I’ve gone on to find my fair share of placer nuggets, both large and small. And each time I do it’s a special moment in my mining life. But I have to admit that very first find was the greatest nugget “high” I’ve ever experienced. However, there are a lot of people who aren't gold miners who choose to buy their placer nuggets for any number of reasons...as specimens to add to their mineral collections, as the basis for pieces of jewelry, or simply as objects of beauty to have and to hold, to name but a few. But buying gold nuggets these days has its inherent dangers as you're about to find out. You see, there are always those who seek to cheat, scam, lie, and steal when it comes to all things gold. And gold nuggets are no exception to this rule. In my online blog, Bedrock Dreams, I've written quite a bit over the past 10 years about mining claim and gold scams, and I’ll say with no false pride that I've done my best to expose a number of hustlers and scammers in this regard. As a result I’ve taken varying amounts of “heat” for doing so. This has included angry and threatening e-mails, the posting of negative-oriented copycat websites with the words "bedrock dreams" as part of their URL addresses, actual cease and desist orders from attorneys, and…last but not least...one potential lawsuit for defamation of character. The latter issue I find highly interesting because it begs a salient question. How can you defame someone who has no true character or honesty in the first place? I rest my case. Unfortunately, some of the disreputable types I lit up in the past by naming names are still out there…yep, still lying, still cheating, and continuing to steal from the unwary and unsuspecting. Sad, but true nonetheless. But, I digress as I tend to do quite often. The core topic of this article is not my struggles with thieves and scammers but the risks involved with purchasing gold nuggets. Of course, most (if not all) of you reading this are small-scale gold miners or are involved in mining to one degree or another. You are already savvy in this regard, but many other people out there are not. That said, however, all of us need to be “street” smart, remain wary, and do our research on the front end…not the back end when it’s already too late. Why? Because there are still numerous scammers out there these days hustling "natural" gold nuggets and specimen gold pieces that are only as natural and pure as the base metal underlying their gold plating. And lest you take these bogus nuggets lightly, some of these fakes are extremely realistic in look, feel, and weight and have fooled many people who thought themselves well-versed in all things gold. In fact, some of these nugget “impostors” are so good more than one specimen collector has been taken in by them and so have a number of jewelry designers or producers, not to mention your average Janes and Joes out there. I like to believe in my heart of hearts that few small-scale miners with any real field experience have been duped this way, but you never know. One of the first public venues to really get after this fake nugget thing was goldrushnuggets.com. A tip of the hat to those good (and honest) folks for providing the basis for this article (and the images of fakes) and for being one of the first websites to bring this sort of scam to the forefront. That said, let's take a look at some of these fakes in terms of how they're made, how they're sold, and how they can be detected by an experienced and discerning eye. 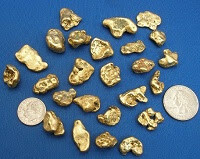 By far and above the most common form of fake gold nuggets are those using copper as their core or body. I know it’s not rocket science, but scammers and frauds can purchase natural copper nuggets fairly easily for much less money than gold would cost them. They can also mold and cast copper to suit the needs of their nefarious enterprises. The path of least resistance many scammers take is to buy natural copper nuggets and then electroplate them in a gold wash or coating of varying purity. Voila! 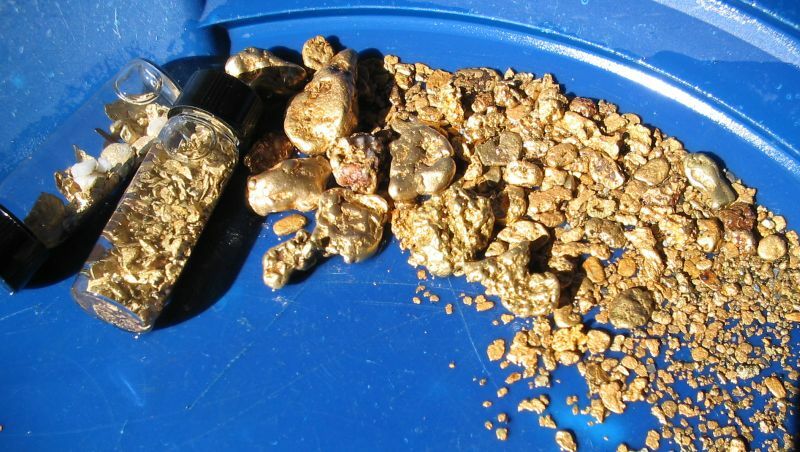 Instant gold nuggets on the cheap (for the scammers, anyway). 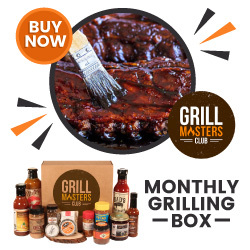 For the unwary buyer it's time to pay premium money for something that cost the scammer very little and will result in a large profit for them. What's not to like here if you're a thief and a fraud? Some scammers also mold and cast their own "gold" nuggets using molten copper and then electroplate the finished product. However, perpetrating fraud in this manner takes more time and is rarer in the scamming world. It still happens, however. 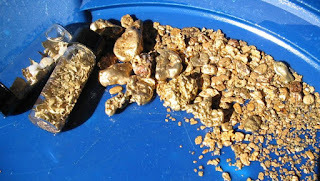 The problem with fake gold nuggets using natural copper nuggets as their core is that they are extremely difficult to spot and the buyer usually doesn't realize he or she has been had until the fakes have been paid for and delivered. Once in hand, the phony nuggets start raising questions because they don't just feel right (copper’s specific gravity is about half that of gold) or look right. That is, unless you're a star-struck greenhorn or specimen collector who just fell off the turnip truck when it comes to real gold. (Copper nugget fakes. Look pretty good don't they?). 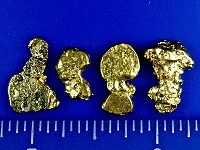 Fakes using lead as their core are usually molded and cast by scammers and coated with a gold wash in the same manner as fraudulent copper “gold” nuggets. Lead fakes are easier to spot, however, even in the digitally altered photos scammers use to sell them online because they simply look unnatural or "off" to anyone with any practical gold knowledge or experience. Their shape and form can be weird-looking to the experienced eye and quite often the same mold is used for casting them so you get lots of "twins" or duplicates (even triplicates and beyond). As you know, Ma Nature doesn't work this way when it comes to creating gold nuggets so that's a dead giveaway to anyone with a modicum of knowledge. If you really want to cast aside any doubts you may have about lead fakes, simply cut a piece off of them using clippers or strong scissors. You’ll quickly find out all that glitters is not gold. Gold is very expensive as you already know and paying top dollar for "nuggets" made from re-cast lead fishing weights is going to make the buyer feel REALLY bad, to put it mildly. Then when that poor soul’s anger accelerates they’ll be looking to do great bodily harm to the lying SOB who sold them a dog dropping masquerading as a real gold nugget. By then, however, the scammer is just another nameless and faceless internet thief. Most of you miners know by now that nice nuggets can command top dollar over and above their melt value depending on their size and overall shape. The greater the size of the nugget or the more unique it is in terms of its shape or composition (i.e., crystalline, matrix material still attached, shaped like a state, etc.) the more dollar value that nugget has to mineral collectors, museums, and others. The more sophisticated fake nugget scammers out there use this approach to get you to pay top dollar for their "creations." Unlike the copper and gold fakes already discussed, these little beauties have a core of real gold but they're NOT natural nuggets. The scammers make these "psuedos" by molding and casting what they consider good representations of natural gold nuggets. They then sell them as the real thing. If there's any semi-positive aspect to this scam it's that you are getting real gold, albeit 10K or 14K. The sting a buyer will feel, however, is in knowing they paid way in excess of the actual gold content of their fake “natural” nugget, as well as the huge let down when they find out that beautiful natural nugget is an impostor. Ye gods and little fishes!! Really? Yes, unfortunately. There are some very naïve and under-educated (from a gold standpoint, that is) folks out there who get scammed by buying chunks of iron pyrite as "real" gold. 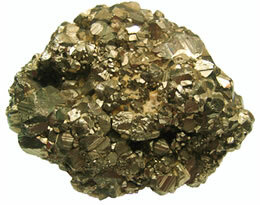 Good old iron pyrite or iron sulfide...the classic form of "fool's gold." I’m reluctant to say this, but anyone who buys iron pyrite samples as natural gold qualifies for the annual Darwin award. The absolute level of ignorance involved here is beyond appalling...it's downright disturbing. Then some folks who read my blog wonder why I'm always harping about doing your research up front, educating yourself in all things gold, and getting some field experience under your belt. It may sound cruel on my part but I have ABSOLUTELY no sympathy for anyone who is idiotic enough to shell out their hard-earned dollars for total, unadulterated crap. I can’t say it any plainer than that. Fake nugget scammers invariably weave their sticky webs online (no pun intended here). Why? Well, common sense dictates that if a nugget scammer were to work out of a brick and mortar storefront sooner or later an irate customer is going to kick open the door to that not-so-fine establishment, shotgun at the ready, and wave the fake nugget they purchased high in the air before discharging both barrels in the direction of the aforementioned scammer. (I’m teasing here and don’t advocate anyone taking this approach no matter how angry they may be). On the world-wide web there are numerous fake nugget scammers doing their thing as I write this article. Unfortunately, eBay often gets a bad rap in this regard. In all truth, it’s really not eBay's fault that scammers prowl their online sales corridors to work their dirty deeds. eBay does its best to try and root out thieves, hustlers, and scammers but that task is nigh impossible given the shadows scammers hide in and how they're able to manipulate the online "system." But eBay is not the only online venue where fake nuggets are sold as the real thing, so buyer beware. As an aside someone asked me recently about gold sellers at various gold or mining “shows.” Although anything is possible, I don’t think you’ll have problems buying gold (if so inclined) at these shows. The reason I say this should be obvious. First of all, the small-scale mining community tends to be a tight network for the most part. Miners and equipment dealers tend to know one another or of one another. Any scammer working one of these shows will be found out in short order, unless I miss my bet. So it’s essentially a one or two-shot deal for a scammer. That’s why these thieves prefer to sell online. Are there honest gold and nugget dealers out there? Sure there are. But to avoid being burned you’ll have to do some “legwork” to find out who’s who and what’s what. If potential buyers fail to take the simplest precautions to protect themselves then the end result is on those buyers…no one else. I had some brazing rod that dripped into little gold (brass) nuggets......I thought about tossing a few into a friend's sluice box, but decided it would be cruel. About like those fake winning lottery tickets. A joke that is hurtful Ain't funny! Worse when you are doing it to try to sucker someone out of money. I hate a thief or a liar. Both are low down scum in my book. Well Gary, I'm ashamed to admit I used the fake lead nuggets (spray painted gold) thing on my wife's sister's hubby back in the 1980s! But my karma came back around. Later on I was duped with the brass welding rod thing up on the North Yuba. So it goes! Ha! I'm glad to hear I'm not the only one with a mean streak! when I first got started in gold prospecting, my young son and I were up at this campground at upper Big Tujunga Canyon. We were walking along the creek and spotted what looked like some large nuggets just laying in the dried creek bed. Our eyes were as big as saucers! But when we picked them up we noticed that they were light and even to our novice thinking realized that we had been had! What a hoot. It's a laugh a minute when some wag pulls your leg in the goldfields!